Melbourne's hundreds of markets are an important part of the mix the help define Melbourne's unique character. One any weekend you can find Melburnians and visitors alike trawling their way through one of the myriad of markets and soaking up the atmosphere. "This is a FANTASTIC website - now I'm tempted to go to 4 markets each Saturday and Sunday - I would never have known there are so many operating in Melbourne if not for White Hat!" Many of the inner suburbs have their own market which operates on selected days of the week, and these markets help define and reflect the nature of their local community Reflecting their origins as public markets where growers producers and other vendors could bring their goods to market they only operate on certain days of the week - otherwise there would be no time to grow or make the goods. Prahran Market has great delicatessens reflecting the affluence of nearby South Yarra and Toorak. The fish at the Footscray Market is plentiful and cheap as one would expect with a large Vietnamese population. The Preston Market has a strong Mediterranean influence. South Melbourne Market offers produce on a Sunday, while at the Gleadell Street Market in Richmond you can still find produce grown in local back gardens and a homely European flavour. Dandenong Market is a one stop shopping with a lively atmosphere. But the queen of them all is the wonderful Queen Victoria Market. If you only visit one market in Melbourne, this has to be it. Community markets like those mentioned above were of course the original farmers' markets and you will still find many stalls at these markets where the stallholder has grown or produced some or all other goods themselves. In recent years there has been a resurgence in farmers' markets with a particular emphasis on organic products and sustainable farming practices. For a comprehensive listing of these go to Farmers' Markets in Victoria. "Can I . . compliment you on your fantastic web site - the width & depth of information your provide is a real credit to you. Keep up your great site nothing else like it. " Melbourne has a small number of markets where artists and skilled tradespeople have banded together to create an outlet that bypasses hefty gallery or retail commissions. One such Market is the Rose Street Artists' Market. You can also find markets specialising in design at Design in Melbourne. Melbourne and Victoria have a large number of markets selling art and crafts. Some markets have conditions specifying that all goods should be hand made or home made or that the stallholder must have been directly involved with the manufacture of the goods, etc. Some prominent art and craft markets of this type are the St Kilda Esplanade Market and the Arts Centre Sunday Market. Of course such conditions often don't preclude the sort of semi mass produced hand-made items that are the same month after month, and, after all, that may be what you are after. You will find a large number of craft markets amongst the comprehensive listing of Melbourne markets below. In any one week there are large numbers of markets featuring trash & treasure, bric-a-brac, pre-loved goods, olde wares, just plain junk and that thing you have been chasing for years. Some examples of large markets in Melbourne selling all of the above plus a fair bit more include Pipeworks Market, Laverton Rubble & Riches Market, and Caribbean Gardens, while in country Victoria such large markets include the Geelong Mill Markets and the Bendigo Showgrounds Market. Many of the larger markets are easily accessible by public transport and an all day ticket to ride the complete system in Melbourne on a Saturday and Sunday is incredibly cheap (see money saving tips). You can even travel to and from Bittern Market on the Mornington Peninsula for a total of $2.90 (see a description of the trip). Queen Victoria, South Melbourne, Prahran, Preston, Footscray and St Albans markets are close to either train or tram. Anything in the inner suburbs is likely to be close to a train or tram. In the outer suburbs buses can often be few and far between so choosing a market close to a railway station is safest. Look out for this situated in railway station carparks such as the Gully Market, Blackburn, Bentleigh etc. Dogs are rarely if ever allowed at indoor markets and usually cannot be taken to a market held at a racecourse. Dogs on a leash are usually allowed if the market is in a public park or similar open public space. If in doubt check with the organisers. Of course you don't have to a market with the intention of buying something. You can just go along to soak up the atmosphere. Twilight markets usually have an atmosphere of their own and you can find a comprehensive listing at Twilight Markets in Melbourne. Then for others aren't simply a matter of making money by trading - they are a way of life and serve an important function in the cycle of life in Melbourne. For an example see our Melbourne Newsletter No.183 of 3rd August 2006. The following listing contains markets in the Melbourne metropolitan area alphabetically by suburb. For a more comprehensive listing of markets in Victoria (including Melbourne) together with grouping by day of the week, go to Markets in Victoria. 5.30 to 9.30pm, Thursdays, Jan & Feb 2020? An event held several times a year showcasing products from a range of Melbourne designers. It usually attracts a large number of visitors with stalls featuring clothing, accessories, homewares, furniture, lighting and more. Speak to the deisgners and enjoy the food and coffee on offer. Entry charges apply. Entertainers - bands show-casing different musical styles, roving performers and children’s activities. Bringing favourite European street eats to Melbourne’s iconic market sheds for a five-week season. On the menu you can expect to see German currywurst, Portuguese barbecue, Belgian frites, Irish Guinness wings and much more. Enjoy eating and shopping at over 40 stalls, plus live entertainment from the amphitheatre-style stage and Euro-inspired bars. There’s even a delightfully kitschy silent disco celebrating all things Eurovision. The Nunawading Market is an Art & Craft market which has been operating since 1985 and, in White Hat's opinion, the quality of the offerings has continued to rise over time. The market is based on the principle of Make it - Bake it - Grow it and features gourmet foods, fresh produce, original art & craft, jewelry, garden products, gifts and baby wear. There is a special Christmas Market each year in December. In 2019 this will be on 8th December from 1 to 5pm. This is a long-established large outdoor market featuring home made and home grown goods. Parking fees apply and no dogs are allowed. ..
2019 markets commence in August - dates to be announced .. Flemington Racecourse Epsom Rd, Gate D, Flemington ..
Usually first weekend in December .. Wattle Park Chalet, 1012 Riversdale Road, Surrey Hills ..
8.30am-5.30pm, Mon-Fri, form 1st weekend in Dec to Christmas Eve .. Information Victoria Bookstore, 356 Collins Street., Melbourne ..
A fairly sizeable market offering Home-made, Home-grown and Hand-crafted items. Lots to see and buy! Partially undercover, plenty of parking. ..
An indoor/outdoor market with craft, clothing and bric-a-brac. ..
White Hat can recommend this market with farm-sourced and organic produce set in pleasant parkland as one of Melbourne's better farmers' markets. It has quite a range of stalls and a good balance of produce from fruit, veg and meats through to chutneys and olive oils. ..
8am to 1pm, 2nd Sunday of month .. Nunawading Civic Centre, 379 Whitehorse Road, Nunawading ..
Buy swap sell everything dance. Shoes, props, costumes, materials, beads, everything you can think of. Come along and pick up a great deal. $2 entry ..
1pm to 4pm, Sunday 22nd February 2009 .. Northcote Town Hall, High St, Northcote ..
Take 2 Markets is Melbourne's premier recycled fashion event for women. Our March event is part of the L'Oreal Melbourne Fashion Festival Cultural Program and we are staging a whimsical fashion show at 1pm. In addition to the fabulous bargain fashion buys there will be a whole room of pampering treats and brand new merchandise. Come along and spoil yourself. Please note the 4th December market is no longer taking place ..
10am to 3pm, selected Saturdays & Sundays .. Hawthorn Town Hall, 360 Burwood Rd, Hawthorn ..
9am to 4pm, 2nd Sunday of most months .. Collingwood Town Hall, Collingwood, ..
9am—4.30pm, 2nd Sunday of most months .. Springvale City Hall, Springvale Road, Springvale, ..
9am—4.30pm, 4th Sunday of most months .. Broadmeadows Town Hall, 1079 Pascoe Vale Road, Broadmeadows, ..
Art, fashion, homewares, jewellery, ceramics... all locally made in Australia. Our wonderful range of artists and designers make this market a busy and bubbling place for you to meet the makers and find wonderful Australian produced goods. Market dates: 7th November 2010, 5th December 2010 and 9th January 2011 ..
10am to 6pm .. Northcote Town Hall, 189 High St, Northcote .. The Rotary Club of Springvale City host a market with trash, treasure, atys, crafts, clothes, tools toys, second hand goods etc. Stall fee $10 Entry fee, gold coin. ..
8am to 2pm, 2nd Sunday of month .. cnr Lightwood & Lawn Rd (opp. Sandown Park Rlwy Stn), Springvale ..
At this Boutique indoor market you will find art, craft, handcrafted jewellery, gourmet foods, fresh produce, plants, organic skin care products, eco-products and items sold in support of community groups. Visit the community garden then sit, read a paper, relax and enjoy refreshments. Market entry by coin donation. Dates are 4th December 2010, 16th April 2011,16th July 2011, 8th October 2011, 2nd December 2011 ..
Markit@FedSquare is a biannual curated design market focusing on illustrative and decorative based design products including fashion, jewellery, homewares, stationery & illustration. Markit@FedSquare invites you to meet the designers, talk with them about their products and buy something beautiful. ..
Twice yearly - next date to be announced .. The Atrium & BMW Edge, Federation Square, .. Original Mould is a unique project initiated from local creative minds working to provide lasting opportunities and a starting point for underground, emerging local artists Original Mould is designed to provide a platform for young emerging artists or art enthusiasts from Melbourne to showcase their own designs and art in a small market space open to the public. In its debut year, the market is a celebration of the thriving artistic talent found within the confines of the city of Melbourne. The daylong market event will promote local undiscovered artists and provide them with the opportunity to cross promote to a keen consumer audience and industry personnel, maximising a potential future in a quasi-commercial industry. With a mix of street art, fashion, design and fine art, along with live music from local band The Adventure Spirit - the venue will transform into a bustling independent art and design arena. 1000 Pound Bend is a Melbourne street level converted Harley Davidson warehouse located in the CDB. Already a popular hub with young creative's in Melbourne this is the perfect venue to hold Original Mould. Next market, 6th November 2010. ..
1pm to 7pm .. Thousand Pound Bend, 361 Little Lonsdale Street, Melbourne .. The Regional Producers’ Market at Queen Victoria Market recognises the important link between farm produce, farmers and markets. Located in the centre of the vibrant and bustling Queen Victoria Market, it will showcase food and wine from country Victorian regions including the High Country, Yarra Valley, East Gippsland and Mornington Peninsula. The launch event for Market Week, the Regional Producers' Market will bring to Melbourne the very best of regional Victorian produce and the producers who know it best. ..
9am to 4pm, Sunday 19th September 2010 .. Queen Street, Queen Victoria Market, .. The Organic Farmers' Market complements the Queen Victoria Market's existing organic offer with selected regional producers offering only authentic organic produce. Meet growers and food artisans who truly understand sustainable farming methods. This is an Organic Farmers’ Market and as such all businesses operating from the Market must be registered with one of the recognised organic certifying bodies. .. Queen Street, Queen Victoria Market, ..
Our market caters to those who want to buy and sell quality, used and new babies and children’s clothing, toys, prams, cots, nursery furniture and anything to do with babies and children! A great way to save precious dollars or to make some through holding a stall of your own. Over 45 Stalls - Lots of variety Free face painting & kids’ activities. Come along and grab a bargain. Further information at www.munchkinmarkets.com.au ..
10am to 1pm, Sunday 18th July 2010 .. Jamieson Way Community Centre, 59 Jamieson Way, Point Cook .. Located in a carpark close to Sydney Road, this market features arts and crafts from local artists. There is roving entertainment as well as workshops.The next market is on 14th December 2013 ..
11am to 4pm, selected Sundays .. 27 Weston St (carpark), Brunswick .. Locally designed wares from Brunswick plus food from the trucks and drinks from the local bar. ..
11am to 4pm, 2nd Sunday of Month, Nov to Feb .. Howler Carpark, 7-11 Dawson Street, Brunswick .. The Northcote Town Hall Kris Kringle Night Markets are on again with over 50 stall holders selling locally hand crafted items such as designer fashion, accessories, giftware, jewellery, ceramics, woodcrafts, homewares, kids’ items, and much, much more. Bring the family and enjoy free live entertainment each week while you shop. Food available on site. .. Dates TBA .. Northcote Town Hall, 189 High St, Northcote ..
Gourmet seasonal producers and growers mixed with hand made local boutique crafts. Dates for 2014 to be announced. ..
.. Cnr Station Street and Kambrook Road, Cnr Station Street and Kambrook Road Caulfield ..
An occasional market which crops up from time to time at changing venues. Goods on sale include babies clothing, fashion items, accessories, candles, gifts and more. Future dates to be announced. ..
Kidz Stuff has everything you need from Pregnancy to 12 years old. 30 stalls will be selling pre-loved quality items of all shapes and sizes. Entry is free, and there will be entertainment and a lucky door prize. Stalls are $30 each. ..
9am to 12noon, Saturday 16th May 2009 .. Brighton Town Hall, Wilson Street, Brighton ..
A market celebarting all things craft, local and community as well as stalls selling .fresh foods,locally grown produce and plants. Saturday 2nd May 2009. Further dates to be announced ..
10am to 3pm, occasional Saturdays .. 99 Leinster Grove, Thornbury ..
Stalls selling pre-loved babies and kids' toys, clothing and lots more. Bargains for everyone. No entry fees. Food available and kids entertainment. ..
A market which says it has lots and lots of bargains and we have no reason to disbelieve them. White Hat has not yet been able to attends so we will give a fuller description after we plan a visit. .. Peek A Boo Market your baby & childrens market offers huge bargain prices on quality pre loved items related from newborn, baby to preschool kids. You can find just about everything from furniture, clothing, toys, prams, books, high chairs to car seats and many more. Entry Fee $2. To Book A Stall visit our website at www.peekaboomarket.com.au ..
9am to 1pm, Sunday 3rd May & 14th June 2009 .. Berwick Fields P/S - Gymnasium, ..
With a large number of stalls winding through the Lithuanian Club, you can expect to see a range of wares from unique vintage finds, to tasty homebaked treats, to handmade toys, clothing, stationary, textiles and homewares. A small entry fee applies. Forthcoming markets are from 10am to 3pm, 22nd July, 19th August & 9th September 2012. ..
from 10am, selected Sundays .. Lithuanian Club, 44 Errol St, North Melbourne ..
Show Pony the Carlton Hotel & Studio's design market is a unique market outlet for locally made objects, furniture, lighting, art and people with music, food & drinks on a Sunday. Curated to present a collective of locally made souvenirs and objects being sold while the Carlton Hotel clientele wine & dine. For trader applications and enquiries:Email info@aestheticalliance.org. Current dates - 21st Feb, 21st March, 18th April, 16th May, 13th June & 18th July 2010 ..
12noon to 6pm selected Sundays .. The Carlton Hotel, 195 Bourke Street, Melbourne ..
Do you have kids aged up to 6 years? Stacks of outgrown excellent quality baby and children’s gear taking over your house? Be a stallholder at the Children’s Markets and turn that clutter into cold hard cash; it’s a fun day out with other mums, easy and promotes recycling. If you’re a designer of stylish and unique handcrafted children’s wares then this is the right place for you! We’d love to see your beautiful peices show cased here in our who’s there category below and on market day. $3 entry fee (kids free). Please note on the 14th of March, this market will move into the Main Street Festival as part of the Mordialloc Festival by the Bay More information at http://www.childrensmarkets.com.au/ ..
10am to 2pm, 2nd Sunday of even numbered months .. Allen McLean Hall, Corner Lewis and Albert Streets, Mordialloc .. If you have stunning clothing and accessories that you’re not going to wear again and are just too beautiful to give away, why not reclaim your closet, book a stall and make some cash at the Ladies’ Markets? It’s your place in Melbourne to buy and sell womens preloved fashion and accessories. You’ll also find a selection of local designers showcasing their stylish and unique women’s ware. $3 entry fee (kids free). More information at http://www.ladiesmarkets.com.au/ ..
10am to 2pm, 2nd Sunday of odd numbered months .. Allen McLean Hall, Corner Lewis and Albert Streets, Mordialloc .. Handmade - Melbourne Indie Design. Vintage clothing & bric a brac. There will be over 50 market stalls, activities for the kids and great door prizes. Entry via gold coin donation. ..
10am to 2pm, Sunday 9th August 2009 .. The Melbourne Lithuanian Club, 44 Errol Street, North Melbourne .. The St Matthews Family Market Day has fairy floss, cake and coffee, popcorn, showbags, lucky dips, nail painting, sports clinics, kids corner, temporary tattoos, raffles and lots more stalls. ..
10am to 3pm, 18th October 2009 .. 95 William Street, Fawkner ..
An occasional alternative designers market. $5 earlybird entry; $10 after 3:30pm. Fashion show at 4:30pm. ..
1pm to 6pm, Saturday 5th September 2009 .. The Colonial Hotel, 240 King Street (cnr Lonsdale Street), Melbourne .. Round She Goes is a preloved fashion market for women in Melbourne. At Round She Goes you can buy preloved designer and quality vintage fashion and accessories from over 85 different stallholders (now that’s pretty big). There is also locally designed jewellery and accessories and even some cool craft. Round She Goes has become a not-to-be-missed event in Melbourne. ..
An indoor market featuring vintage fashion, up and coming Australian designers in fashion and jewellery, a place for artists to display and sell their wares and an opportunity for a browse, shop and mingle in a relaxed atmosphere. Please note that this market tends to change its date and time of operating a fair bit so check their website at Blackbird Market before making a special trip. ..
11am to 4pm, 2nd Sun of month .. The Workers Club, 51 Brunswick Street, Fitzroy .. 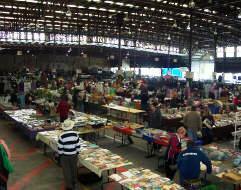 The Collectors Market is still running but has changed its name to Docklands Sunday Market.